Our team motto is, "Where work is play." We love to laugh, ride our bright-red scooter through the halls, and are tickled to test out new games. Our love of play transfers into the toys, games, and tools we create, making many learning experiences, well, more playful. We know how to capture your child's attention and imagination. From packaging to product, we think outside of the toy box to help your child learn about the world around them. Sometimes that means indulging crazy ideas and borrowing inspiration from all around us. We prefer active learning to encourage your child to create learning experiences in real life. Let's just say kids are somewhat over-served in the tech department these days. We've been helping kids learn to think for the last 50+ years. We take great pride in working with experts worldwide–from scientists to teachers to artists–to ensure that what we're doing is always the very best it can be. We want to exceed your expectations. We work hard to make sure our products are top-quality, and that kids feel confident and successful after playing with our toys, games, or tools. If our products are not giving your kid an exceptional experience, then you can simply return it and you will get your money back. Hot Dots Jr. Pete the Cat I Love Preschool! Learning just got a little groovier Pete the Cat star of the eponymous New York Times best-selling book series and Hot Dots Jr. team up for the first time with new interactive learning sets. I Love Preschool level 1 of the preschool series provides preschoolers with 200 lessons on a variety of subjects including reading math science social studies and more. 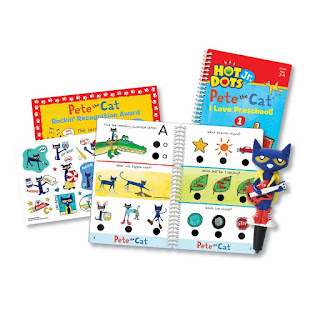 It includes two spiral-bound activity card sets an all-new Pete the Cat -Your Groovin Schoolin Friend pen reward stickers and an an award certificate for little learners who are ready to advance to the next level. Perfect for independent learning-- simply press the pen on an answer for immediate audio and visual feedback.Features. Promotes groovy interactive learning and offers ample practice time. Develops early learning skills necessary for school success. Provides confidence-building feedback. Encourages independent self-paced learning. My 3 year old has a few Pete the Cat books so it was a welcome sight when she got her Hot Dots Jr. Pete the Cat Preschool Rocks! Level 1 Set by Educational Insights. I homeschool my two older daughters so my three year old has been one eager beaver to have her own set of school books and now that she does, she loves to pull them out when it comes time for school. She enjoys matching the letters, finding the shapes and the various other activities in the book. I was pleasantly surprised how quickly she picked up how to use the pen. She has no problems at all placing the pen on the dots and quickly learned what the sounds mean. She loves to do a little dance to the music when she gets it correct. This is a terrific set to help prepare preschoolers for kindergarten! Hot Dots Jr. Pete the Cat Preschool Rocks! Kids will be learning in no time with Preschool Rocks level 2 of the two all-new Hot Dots Jr. Pete the Cat preschool sets. A perfect complement to the Pete the Cat storybooks that children parents and teachers already love. This set provides 200 lessons on a variety of subjects such as reading math science social studies and more. 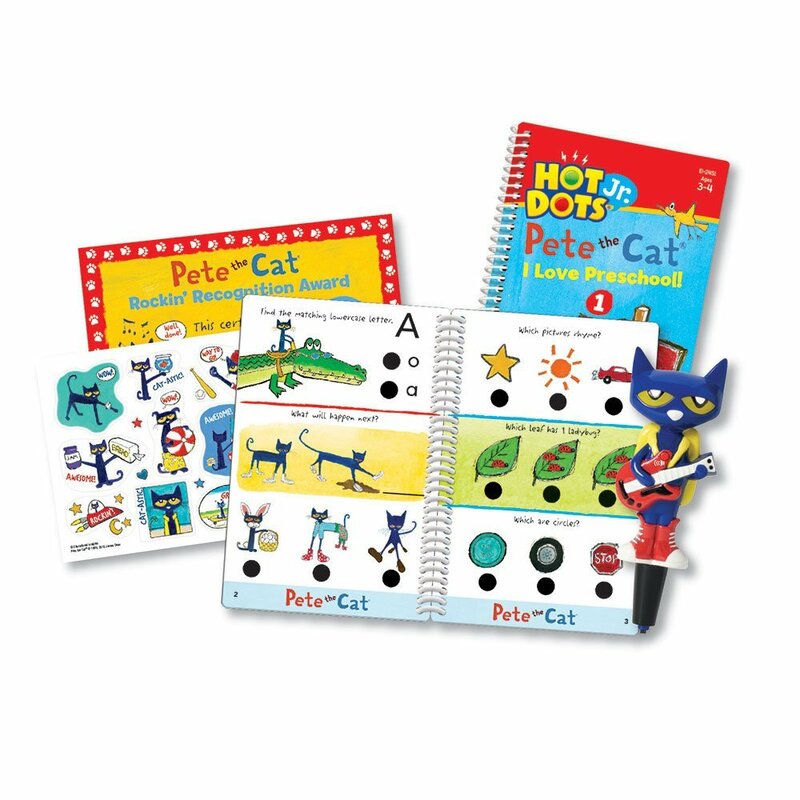 It includes two spiral-bound activity card sets an all-new Pete the Cat-Your Groovin Schoolin Friend pen reward stickers and an an award certificate for little learners who are ready to advance to the next level. Perfect for independent learning-simply press the pen on an answer for immediate audio and visual feedback. Features. Promotes rockin interactive learning and offers ample practice time. Develops early learning skills necessary for school success. Provides confidence-building feedback. Encourages independent self-paced learning. Helps develop preschool skills in reading math science social studies and more. I love that the learning fun can continue with Hot Dots Jr. Pete the Cat Preschool Rocks! Level 2 Set by Educational Insights. I also love that this set provides 200 lessons and helps prepare preschoolers for kindergarten. 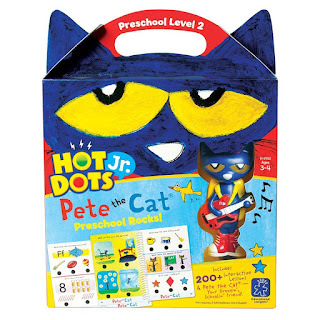 Another great thing about Hot Dots Jr. Pete the Cat Preschool Rocks is that kids can have fun while learning. 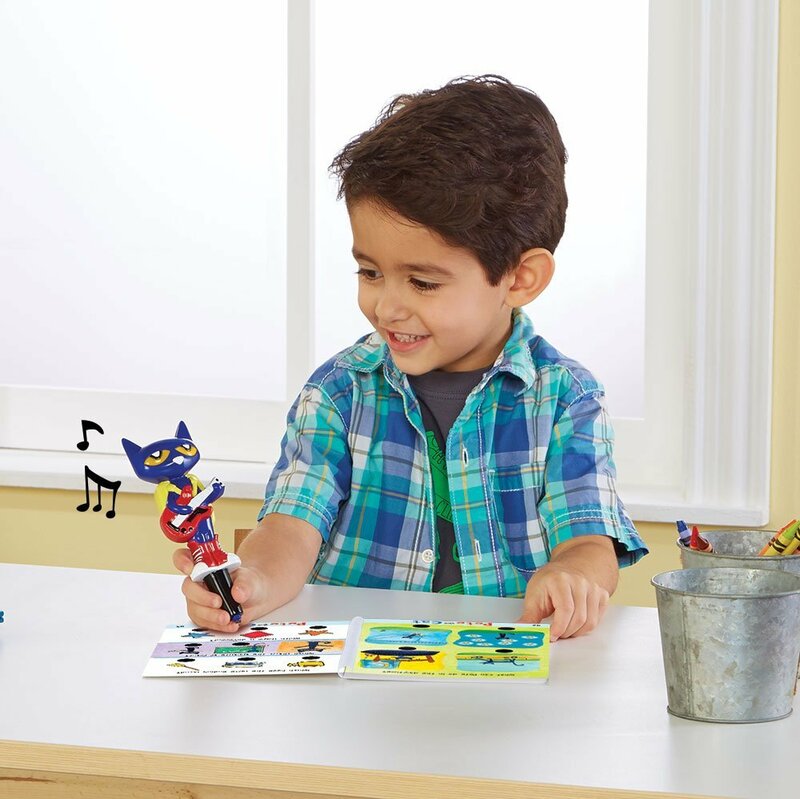 As a homeschooling mom I know how important it is to make learning fun and with Hot Dots Jr. Pete the Cat Preschool Rocks you can accomplish just that. We've had both set one and two of Hot Dots Jr. Pete the Cat Preschool Rocks for about a month now and my daughter has already learned so much. She loves sitting down with me and using the Pete the Cat pen to learn. This is an awesome set and I highly recommend it! This is so fantastic! We LOVE Pete the cat! I am all for educational toys. Combining learning and games is the best! Pete the Cat is so cute! This product looks great for young kids and games that have an educational twist are winners! This seems like a perfect way to get kids ready for preschool! I'm sharing this with my sister in law so we she can have it for my niece! Thanks! This sounds really great and it is cute. This is a great product for learning. So cute. My boys love Pete the Cat. I think this would be a great learning tool for my twins. Pete The Cat looks really fun! I know several kids who would really love learning with Pete. It's great to have this kind of interactive book for preschoolers. Does this have an online version where kids can use the mobile device to get education and at the same time have fun? It would be nice if they can have it available as well. This seems fun! I would like to try this on the twins. I love the fact that it has different levels. Pete the Cat sounds so fun. My girls would love this. When the kids think they're playing but they're learning, it's the best, best, best! Love the idea of integrating technology into early reading! This set is fantastic! I love the idea of learning by playing and being creative :). The cat is funny!